In the past, the gym bag was a bag and nothing more. It was a place for you to keep your workout clothes and that was all. Today however, gym bags have evolved significantly and there are many types out there and many of them have been created for the fashion conscious. They also come with many great features that are beneficial for those who regularly go to the gym. This article is going to look at some of the most important features that a bag should have when you are choosing it. It is important to remember that depending on what physical activity take part in you will properly need a different sort of bag. For example, someone with new boxes will need space in the back for gloves, where as someone who runs will need extra space for a pair of running shoes. Don’t think that storage space necessarily means that you need a lot of room. A common thought among people who are buying a gym bag is that the more space it has the better. However, this leads to the problem that the bag may have only a few items in it and this can make it difficult to carry and not good-looking. Consider what you take to the gym before selecting the bag and decide how much space you need before you buy. Also remember that it should easily be able to fit into a gym sized locker. A bag is something that people tend to throw around, it moves from the boot of the car, to the gym locker, to the laundry room. In most of these places it is either being dumped or crammed into a small space. This means that the bag you select needs to be durable and it should be made from a material that lasts, nylon and cotton are good and strong options that are also not expensive. Leather is something that is popular because it looks good and is also durable. Unfortunately it comes with a major disadvantage – it absorbs smells in the long-term. If you’re stuffing your smelly gym clothes and trainers into the bag for months on end, eventually the leather is going to start to smell and you are not going to be able to wash the smell out. There are several reasons why you need multiple compartments in a bag. Before you go to the gym you’re going to want to separate your clean clothes from your trainers. When you are finished in the gym you’re going to want a space to keep your smelly clothes and you’re not going to want your casual clothes to have absorbed smells while in the bag. Keeping everything compartmentalized or in separate bags is essential. If you are swimming it will also mean you can keep the rest of your gear dry. 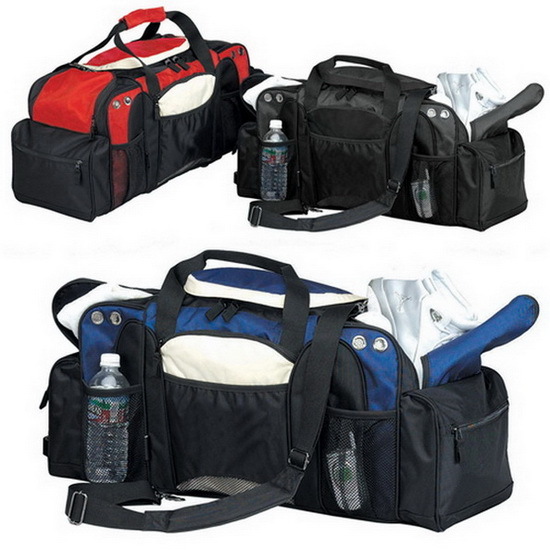 These are just some of the factors you should consider when buying a sport bag for the gym. Remember to assess your requirements before you go out shopping.